Phillips’ passion for aviation is second only to his infatuation with the American experience and the impact that the land, its people, its history and its values have upon one another. This is what he calls The American Landscape, paintings about a time, a place and the course of American events. The Grand Canyon is the iconic American landscape. For millennia, the only sounds heard in the Canyon were those of the elements and all things wild. As man arrived the sounds of early domestication could, only faintly, be heard. By the late 1800s, outfits such as Wellington Starky’s Diamond Bar Ranch heralded the news that cattle was king, even in the Grand Canyon. In 1919, man took to the skies over the Canyon for the first time. A mere nine years later, Grand Canyon Airlines was taking tourists on scenic flights in Ford Tri-Motors such as this one, bouncing the drone of radial engines from ancient rim to ancient rim. 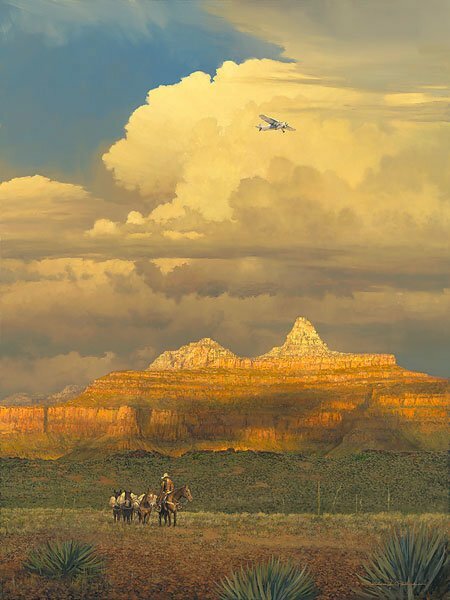 Flights such as this confirmed that as yet another era neared its end in the Canyon, a new one had begun as the crown jewel of the American Landscape.